Lady Elilan heals people. Or does she? The fever is back, and people in Northern Marst are dying. After Elilan’s husband dies under her care, she abandons her divine gift of healing. What good is the “gift” if she can’t save those she loves? Her faith is put to the test when the king commands her to nurse a seriously wounded enemy soldier back to health. Will she rely on her knowledge of medicine or entrust her patient’s life—and her good name—to the One who gave her the gift she has neglected? Elilan must decide what she really believes when death threatens again. "If you enjoyed Mardan’s Mark, you will enjoy Healer’s Curse. Though short, it is very well-written, giving the reader plenty of opportunity to get to know the characters and engage in the story. You will not feel cheated, though you will be hungry for more at the end!" "I love that Kathrese has a heroine who happens to be black as well as a diverse cast of secondary characters." "Healer’s Curse is a lovely novella, full of mystery, intrigue and romance." 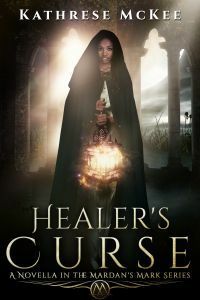 "The novella Healer’s Curse has good themes on bridging differences, the intersection faith and healing and tragedy." "Elilan is a sensitive and courageous heroine and Raymon is everything a hero should be."